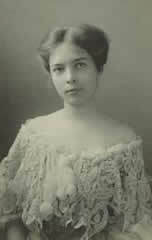 Violet Elizabeth Brown was born in 1885 in Port Washington, Ohio. Shortly after her birth her parents moved to Coffeyville. At the age of 19, Violet married a man from the Wichita Eagle family. They divorced not long after their first and only child, a little boy, died. Violet was what today people would call an independent woman; she traveled the world, had a second marriage and divorce, and went to college. Her second husband, Gustav Koher, was a businessman from Los Angeles. He claimed that his family was in the chocolate business. When they divorced Violet kept his name and moved to Ponca City, Oklahoma to become a librarian. In the mid 1930's she moved back to Coffeyville to take care of her ill parents. When they died, they left the mansion to Violet. Since the depression had such a great effect on her family’s fortune, there was not enough money for the upkeep. So, in 1970, in ill health, Violet decided to sell the mansion to the Coffeyville Historical Society to use as a museum. She took just what she needed and moved into a nursing home in Independence, Kansas. Violet lived there until her death on November 16, 1973, at the age of 88.